St. Louis Firefighters Save Thousands Of Historic Documents In Museum Fire A four-alarm fire at the Karpeles Manuscript Museum on Tuesday nearly destroyed a large collection of artifacts. But firefighters were able to preserve many of the rare items. 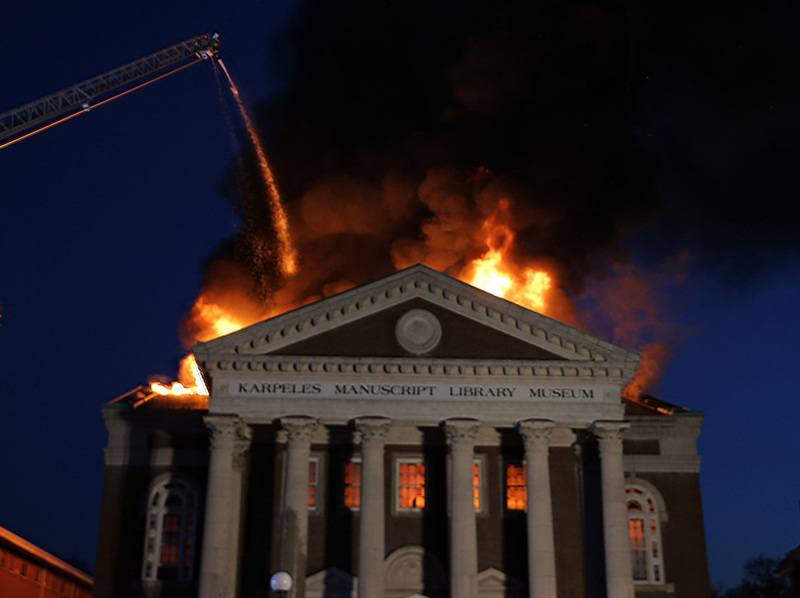 Firefighters battled a massive fire at the St. Louis Karpeles Manuscript Library Museum on Tuesday. The museum houses some of collector David Karpeles' collection of original manuscripts, one of the largest in the world. "They knew they were in a museum," Fire Chief Dennis Jenkerson told the St. Louis Post-Dispatch. "It's like, 'Don't leave empty-handed. Grab something and get it out of here.' "
The blaze raged for about two hours, destroying much of the second floor of the 107-year-old Greek Revival building. The ceiling caved in while at least 20 firefighters were inside. "The entire ceiling came down around and on some of these guys," Jenkerson said. The Karpeles Museum is one of 14 around the country, all founded by David Karpeles, a California real estate mogul who has amassed one of the largest private collections of original manuscripts in the world. St. Louis Public Radio reported Karpeles' archives consist of more than a million rare documents and artifacts and includes a first draft of the Bill of Rights, the paper Albert Einstein used to write his most famous math equation, "E=Mc2," and Noah Webster's first dictionary. 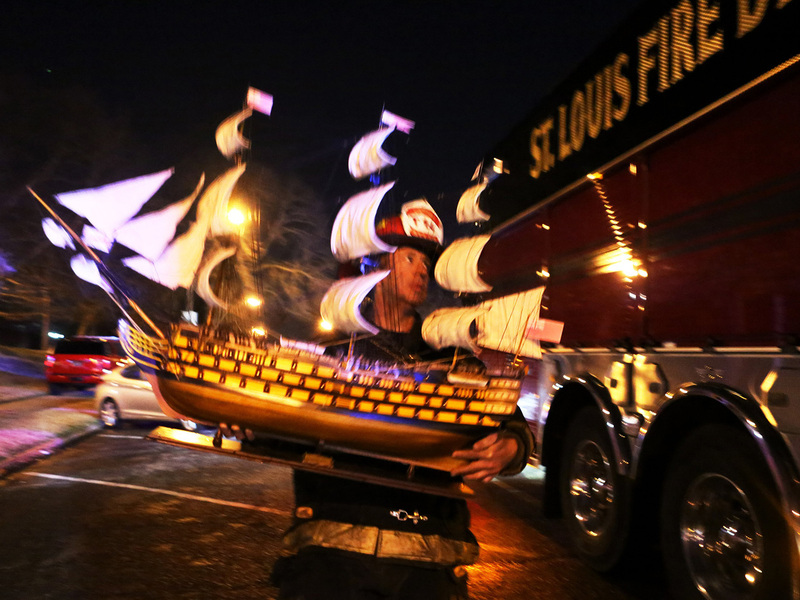 A firefighter carries a ship replica to a firetruck on Tuesday, following a fire at the Karpeles Manuscript Library Museum in St. Louis. Officials with the museum say there was little to no loss and minimal water damage to items in the building. Exhibits are rotated among the different museums every three months, though each site maintains regionally specific curios. Since opening in August 2015, exhibits at the St. Louis branch have included "a Gutenberg Bible, the Confederate Constitution, a map from the Spanish Armada, Babe Ruth's first baseball contract, the first draft of the Bill of Rights, and Columbus' handwritten letter describing the coasts of America in his last voyage of discovery." "All of the valuable documents were saved by the St. Louis Fire Department," Frank Absher, executive director of the St. Louis Media History Foundation told NPR. The foundation rents part of the museum space to display and store its own collection of historic materials focused on recordings, articles and photographs from the region's radio, television and print history dating back nearly two centuries. Absher said firefighters did their best to save as much as possible from the fire and water. Much of the media museum's collection has been backed up with digitized versions which have been stored offsite in recent years. "Some items sustained minor water damage, but for the most part" firefighters ensured the precious artifacts can "continue to be seen by the public," he said.